I've been reading tarot since I was about 13 years old. Back then I saw it as a magical occult oracle that gave me weird coded insight into my future. Today, I use tarot cards as a method of introspection and self-examination. It's a tool to use in the unending quest to understand our selves and our world in a more holistic way. It's a shame that tarot has gotten a reputation as being a scary witchy prop when it can be used best in everyday mundane situations by typical folks like you and I. The tarot is, most simply, a set of cards that has been decorated with images and symbols that are meant to speak to certain universal themes. To read the tarot, we simply think of a question or situation we'd like insight into, shuffle the deck and lay down some cards, and then look at the images and consider how those themes and ideas relate to our question. It's really very straightforward, and we'll get back to that in a moment. I've made the distinction here that this post will teach you to read tarot intuitively. There are many, many methods of learning to read cards, but I generally group them into two sections: Intuitive reading, and Reasoned reading. Most readers use a combination of these methods in everyday reading, but I think it's easier to learn one, then the other, then combine them. Reasoned (or taught) reading is deciphering the cards by literally associating the symbols with their rote meaning. 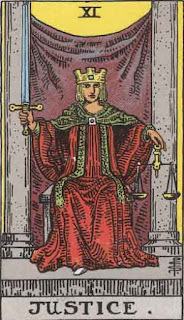 For example, if I were to read the card Justice in a reasoned manner, I'd see that the figure was holding a set of scales which represents, literally, justice, equity, and rightness. This method isn't about interpreting symbols so much as it is about memorizing the intended meaning behind them. For many tarot readers, this is our first foray into the tarot: We buy a deck and refer to the included little white book (LWB) to read the meaning of each card we pull. Reasoned/taught reading is academic in nature and is an essential part of your tarot journey. It's imperative that you study the meanings and associations of cards, learn the occult symbolism, and get an idea of where the author(s) and artist(s) were coming from when the deck was created. However, starting our tarot journey here can be daunting. I'm terrible at memorizing things and, at one time, was convinced that I'd never be able to break free from the LWB. To mitigate this problem I created tarot flash cards and practiced them religiously, trying again and again to memorize the rote definitions of the cards. It wasn't until years later that I stumbled upon Intuitive reading. This method uses our intuition to find meaning in the cards and does not seek out rote definitions anywhere. This method clicked with me instantly and I was thrilled to find that I could finally read tarot easily and freely.But what is intuition? Intuition is the ability to acquire knowledge without proof, evidence, or conscious reasoning, or without understanding how the knowledge was acquired. Personally, I believe that intuition is the heart of all psychic phenomena, and is a skill we all are capable of refining. Learning to read tarot intuitively is a great way to start improving your own intuition, and you'll probably be surprised by how on point it already is. If we were to go back to our example of pulling the card Justice, but this time reading it intuitively, the meaning of the card would depend almost entirely on the situation, the question, and you. Recently I did a tarot forecast in which I pulled a card for each of the next twelve months with the expectation of meditating on the appropriate card during the appropriate month. For this month, May, I pulled Justice. 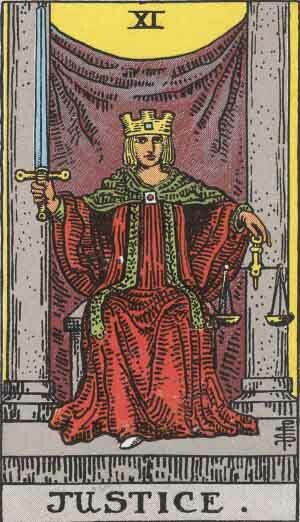 After sitting with the card, looking at it, thinking about it, and letting my mind wander, it occurred to me that the message Justice had for me was to strive to be the point of balance. Justice isn't the scales, per se, but is the rod upon which the scales rest. Justice allows balance to happen, it doesn't make it happen. This message hit me hard. I'd been experiencing lots of emotional ups and downs this month and battling much greater anxiety than I had been used to. Tarot reminded me, through an intuitive lens, that sometimes the best way to deal with anxiety and stress is to just let it happen and stop fighting it. The calm will come. It has to. The universe is obsessed with balance, or, said another way, with entropy (the diffusion of energy). The two readings I did of the Justice card were thematically similar, but the perspective that came of them was wildly different. This is the key: I believe that it is important to learn to make a personal connection with tarot through intuition before you dive into more intense education. And, really, that's all there is to it. Grab a tarot deck (any one that you like), shuffle it, ask a question, pull a card, and read it. It will feel awkward at first, like you can't possibly have all the information you need, but I implore you to keep practicing. Pull a new card every day and let it speak to you. The best questions to ask your tarot deck are not yes/no questions. Since each card has a positive and a negative aspect, it can be pretty frustrating to decide on an answer. Instead, ask open ended questions that give you room to explore. What do I need to know today? How can I better connect with my spirituality? What direction should I take my business in? Start with pulling one card to answer your question and, as you feel comfortable, try pulling additional cards. You can find endless examples of tarot spreads to use online, but a lovely simple spread is a 3-card spread. Lay three cards in a row from left to right and assign each card position a meaning. Most commonly, the leftmost card represents the past, the middle card represents the present, and the rightmost card the future. In this way you can greatly expand the depth of a reading. Though, I'd warn you not to get too bogged down with spreads yet. Keep it simple and focus on the cards themselves. Use the tarot card as a jumping off point for your intuition. Ask your question, lay down a card, and keep investigating that single card until your mind picks up momentum and goes off on its own. Question: What do I need to know today? Interpretation: The card shows a man looking very pleased with himself sitting in front of a table on which are displayed 9 cups. There is something that turns me off about that guy. He looks smug, like maybe the cups are worth a lot of money and he's rubbing them in my face as if to say, "Look at me! I have it all! Aren't I amazing??" That makes me think of a friend of mine who is always posting photos online of new expensive electronics he's bought. It always pisses me off. Like, yeah, good for him and whatever but all I can focus on is how I don't have a new iPad. I don't have an iPad at all. Every purchase I make on electronics feels like a stab in the gut because I know I don't really have the extra money to spend on that stuff. It irritates me that so many people have the money to blow on fancy stuff and they don't have any concept of how that makes poor people feel. Which, I guess, makes me feel a couple things. 1) I need to remember to be aware of how my actions and words effect other people and, 2) I think it's pretty clear that an iPad isn't going to solve my anger issues. Perhaps I need to make a conscious effort to find happiness with what I have. Perhaps the issue isn't my rich friends, but it's my own unhappiness that I'm projecting. Perhaps today I need to start focusing on where that unhappiness is coming from. A common question I get about intuitive reading is how to know that your interpretation of the card is right. For the purposes of intuitive reading, the answer you get (rather, the answer you know) is the correct answer. Don't concern yourself with the LWB at all. Though, if you're truly having a hard time allowing yourself to access your intuition, it can be helpful, once you've deciphered a particular card, to look up that card in the LWB and compare how your interpretation is similar and different. More often than not you'll find that you came upon the "correct" theme all on your own. Tarot is nothing more than a set of symbols meant to inspire a particular thought in your mind. They are meant to be universal, in one way or another. Therefore, the only thing you need to read the cards is your own mind. When you lay a card down on the table, listen to that voice in your head. It usually knows what's up. If this seems deceptively simple, it's because it is. I'd encourage you to find a deck that speaks to you, and to ask questions often. Keep records of your readings in a journal. As you get more comfortable with the cards, start to deepen your knowledge base. Research books, blogs, and podcasts. Consider taking a class or twelve. Your tarot education will never end, but it can begin today. Grab a deck and start shuffling!